Enjoy a slideshow of Victorian Christmas images shot by local photographer, LeeAnn Brook. Join us for Victorian Christmas and enjoy some spectacular entertainment! Victorian Christmas 2010 is scheduled Wednesday nights, Dec. 8, and 15, from 5-9 p.m., and on two Sunday afternoons, Dec. 12 and Dec. 19, from 1:30-6 p.m. There is no admission charge. Izzi Tooinsky, Sierranaders, Joe Souza & Friend, Village Festival Recorders, Victorian Christmas Singers, Sometimes Singers, David Ayala, the NU Band, a walking Christmas tree, a live nativity scene, Santa Claus and more! Ludi Hinrichs, Joe Souza and Friend, Village Festival Recorders, Victorian Christmas Singers, TommyKnocker Cloggers, Jubilo Minstrels: “Gordy”, St. Ambrose Drama Group, David Ayala, Highland Dancers, Shades of Blue: chorus, the NU Chamber Choir, the NU Band, Santa Claus and more! Izzi Tooinsky, Joe Souza & Friend, Sometimes Singers, Village Festival Recorders, Victorian Christmas Singers, David Ayala, a live nativity scene, the NU Band, a walking Christmas tree, Santa Claus and more! Ludi Hinrichs, TommyKnocker Cloggers, St. Ambrose Drama Group, Village Festival Recorders, Victorian Christmas Singers, David Ayala, a live nativity scene, Sage Po (harp), Thunderfoot Cloggers, the NU Band, Dylan Rodrique & Friend, Santa Claus and more! “The Christmas Card”; filmed in Nevada City, tells the story of a soldier, Cody Cullen, with no family who, while serving in Afghanistan, receives an anonymous holiday card that touches him deeply. While on leave back home, he travels to Nevada City, California, the picturesque town from which the card was sent. Once there, Cody meets and falls in love with beautiful Faith Spelman, who sent the card, and quickly becomes a cherished member of the Spelman family. Yet romance for Cody and Faith seems out of the question, because she has a boyfriend and is about to become engaged. “But there is one that looks even better; so perfectly preserved and warm and welcoming that you have to pinch yourself the first time you take that walk up the hill towards the church, just to make sure it’s real. December 11th at 10 a.m.
December 25 at 8 p.m.
December 26th at 10 a.m.
December 31st at 4 p.m. and 12 a.m.
For more information visit Hallmark Channel’s Website. Experience the magic of Nevada City first hand at Victorian Christmas. This annual, family tradition takes place in December and features holiday activities for all ages: childrens’ pony rides, carriage rides, live entertainment, savory yuletide treats and libations, and of course, Father Christmas! This year the event will be held Wednesday nights, Dec. 1, 8, and 15, from 5-9 p.m., and on two Sunday afternoons, Dec. 12 and Dec. 19, from 1:30-6 p.m. There is no admission charge. Lodging: Overnight visitors are encouraged to book local accommodations early. A dozen historic and charming bed & breakfast inns and several comfortable hotels and motels are located within walking distance of downtown Nevada City, or a short drive from nearby Grass Valley. For more information contact the Nevada City Chamber of Commerce at (530) 265-2692 or toll-free (800) 655-NJOY. 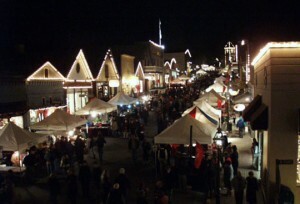 Nevada City’s famous Victorian Christmas Celebrations start this week in historic downtown Nevada City. The downtown area is closed to cars, and holiday celebrants fill the streets. Sample wonderful food and peruse the many items offered by downtown shops, restaurants and friendly street vendors. Victorian Christmas 2010 is scheduled Wednesday nights, Dec. 1, 8, and 15, from 5-9 p.m., and on two Sunday afternoons, Dec. 12 and Dec. 19, from 1:30-6 p.m. There is no admission charge. At all the celebrations there will be chestnuts roasting on an open fire in the Lower Commercial Street Food Court area. Much entertainment is planned all through the downtown area, and carriage rides will be available at the National Hotel. There will be a living nativity scene and Kids Fun at the Alpha Building will feature visits with Santa Claus and children’s crafts. More information here. Wednesday, May 19, at the National Hotel in Nevada City, CA. Social hour at 6:00 p.m. Dinner at 7:00 p.m. Cost: $25— including tax and tip—with a choice of prime rib, chicken marsala or salmon. Seating is limited, call the National Hotel at 265-4551 to make a reservation. Please join us at the National Hotel to give Joany an old-fashioned Nevada City welcome. 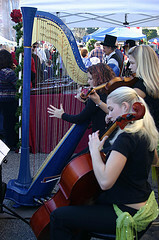 Join us Wednesday, December 2, 2009 from 6:00 – 9:00 p.m. in downtown Nevada City for the opening night of Victorian Christmas. Victorian Christmas, the old-fashioned celebration held each year in this colorful California Gold Rush town, evokes holiday memories of an earlier era. Victorian Christmas 2009 is featured Wednesday nights, Dec. 2, 9 and 16, from 6-9 p.m., and on two Sunday afternoons, Dec. 13 and Dec. 20, from 1:30-6 p.m. There is no admission charge. Children and their parents are invited to visit Santa’s Workshop at 212 Broad St (old Alpha Bldg) this Wednesday 6-9pm during Victorian Christmas. Enjoy holiday crafts and games. Make a hand-made Nevada City ornament for your Christmas or manzanita tree this year! Victorian Christmas is just around the corner. Come enjoy a winter wonderland of lights in Callanan Park plus favorites like Victorian clad carolers, roasted chestnuts, carriage rides, delicious food & drink and lots of holiday cheer! Join us Wednesdays, December 2nd, 9th, & 16th, from 6-9pm, and Sundays, December 13th & 20th from 1:30 – 6pm.